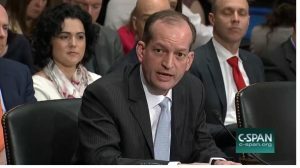 Secretary of Labor Alex Acosta testified last Thursday at a hearing before the full House Education and Workforce Committee, and although I take great pleasure in (deservedly) criticizing Trump administration appointees, he wasn’t terrible — as Trump appointees go. Now let me qualify a bit. I’m focusing only on workplace safety issues, not on any wage and hour, apprenticeship or other labor issues that were addressed during the hearing. Second, his performance varied from fairly decent (regarding enforcement issues) to pretty bad (regarding standard setting and staffing.) And, of course, we’re grading on the Trump-Republican grading curve (which includes Cabinet heads like Scott Pruitt, Rex Tillerson, Betsy DeVos, Ben Carson, Jeff Sessions, Steve Mnuchin and Rick Perry.) We’d grade on a different curve if it was a Democratic administration, or even if it was a more, umm, competent Republican cabinet. worker safety protections are under attack. While the previous Administration issued rules to help end the scourge of black lung disease and to prevent deaths from silica-related diseases, the current DOL has proposed a rollback of protections for construction and shipyard workers who are exposed to ultra-toxic beryllium, and has jettisoned work on standards for toxic chemicals and combustible dust. It is also unclear whether DOL will finalize a December 1 deadline for employers in higher hazard industries to submit summaries of their injury and illnesses logs. Mr. Secretary, without this data, there are questions about how OSHA will secure the information needed to target inspections at those worksites where workers are at greatest risk. While it is true that he lifted the hiring freeze for OSHA CSHOs (inspectors), the process is anything but streamlined from what I hear. Approvals for CSHO hiring are trickling out at a snail’s pace, barely keeping up with retirements. And the agency doesn’t live by CSHOs alone. Whistleblower investigators still fall under the hiring freeze, and the backlog of cases which had been coming down during the Obama administration, is apparently on the rise again. Furthermore, unless you also start hiring mid-level managers and administrative people, the enforcement process slows down as it takes longer to get large cases through and the CSHOs have to do the work that the administrative people should be doing. Retirements don’t happen evenly, so some Area and Regional Offices are hit much harder than others. And of course, the longer an enforcement case takes to issue, the longer workers are forced to work in hazardous workplaces. Acosta conceded that the standard had “complicated and has multiple dates.” Parts are in effect now (construction),and parts will come into effect after some time (General Industry). He again assured Allen that “Parties in litigation close to settlement. If there’s common ground, we should look for common ground. I was disheartened that parties didn’t come to table until right up to the deadline.” And he assured the Congressman that the agency was engaged in efforts to clarify silica information and will redouble those efforts. OSHA has issued lots of educational materials. He may want to point his constituents to OSHA’s silica webpage. What Acosta was really saying is “Forget it.” Barring some surprise reversal in court or some slight modifications as a result of negotiations between concerned parties, the Silica Standard is here to stay. It’s way to big and way too well constructed to repeal. We even defended it it court. I’ve delayed enforcement a couple of times and OSHA has developed some more educational materials, but that’s all you’re getting. So get with the program and protect your workers. Enforcement plays a vital role in OSHA’s efforts to reduce workplace injuries, illnesses, and fatalities. Yet, compliance assistance is a large part of OSHA’s work to ensure employee safety. When employers fail to uphold their safety and health responsibilities, OSHA takes strong, decisive actions. Congressman Lloyd Smucker (R-PA) complained that although most employers understand it is important to provide a safe workplace for their employees, he was concerned that the approach OSHA has taken over the last number of years was “more “punitive” than collaborative.” Why aren’t businesses receiving assistance to provide a safety workplace? has to be balanced by a vigorous enforcement program. So when you have employers who have repeated or willful violations., you have to enforce and enforce vigorously. As a former US attorney, you if need be even refer those if there are willful violations where there is death or serious physical harm refer those for prosecution. Need fulsome compliance assistance for employer trying to do the right thing. Where the employer [engages in violations that are] repeated and willful, then there needs to be vigorous enforcement. OK, I’ve discussed a number of times before (here and here) my feelings about VPP and compliance assistance. The fact is, no matter how many nice words he has to say about VPP, the agency does not have the budget to grow the program significantly without either sacrificing enforcement resources or the integrity of the VPP program. But I am gratified to see Acosta bringing up the need for strong enforcement and even criminal prosecution. Of course, the proof will be in the proverbial pudding, but it’s still nice to see the words coming out of a Trump administration official. Again, all in all, not a bad performance by a Trump administration Cabinet head — at least as far as health and safety issues go. But that was the Secretary speaking. We still don’t have a permanent Assistant Secretary, and it’s unlikely that Trump’s nominee, Scott Mugno, will be confirmed until Spring. Right now, the agency is being managed — or more accurately, not managed — by Deputy Assistant Secretary Loren Sweatt. Mostly, the career staff are running the place, which is not a bad thing. We’ll know more about the direction the agency is heading when Mugno appears at his as-yet-unscheduled confirmation hearing. Again, thanks for your time with Dr. Michael’s doing the work to get some very important rules passed, and thanks for continuing on with this blog.